The wait is over. The Provari has gone to wattage! The ProVari 3 is a powerful microprocessor controlled PV that lets you adjust and fine tune the device to your exact preferences by adjusting the power (in voltage or wattage), along with a number of great new features never before seen. 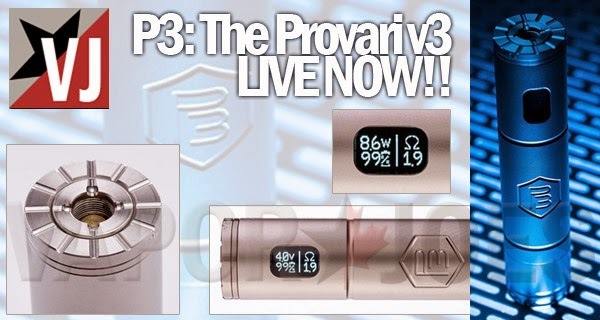 The ProVari 3 uses the latest technology to bring you some new and exciting features. The ProVari 3 has regulated power output which keeps the voltage or wattage the same with each puff regardless of your remaining battery power. As the battery drains, the device will keep the power output consistent, giving you the perfect vapor all day long. ° The ProVari 3 voltage can be adjusted from 2.9 – 6.0 in 0.1 volt increments. ° The ProVari 3 wattage can be adjusted from 3 – 20 in 0.2 watt increments. ° Flat top design provides a clean hybrid look with the latest tanks. ° Self-adjusting center contact pin ensures maximum compatibility with tanks and atomizers. ° The new P3 thread is a unique top connection which allows you to adapt multiple tanks including 510, Ego and P3 threaded tanks (coming soon). As new connections become available, the P3 will be able to adapt with screw-in adapters. Ego style adapters will be sold separately. As new tanks are developed with the P3 thread, they will adapt for a clean hybrid look. ° Built-in sealed OLED display with scrolling icon-based graphics allows you to visually adjust your settings. ° Each device has a unique digital serial number. ° A translucent seven color lighted push button acts as a low battery alert and allows you to select from seven color choices when the button is pressed. There is also a random option which rotates through all seven colors each time you press the button. ° On/Off mode allows you to shut the unit off completely. ° 16 second safety cutoff turns off the unit if the button is held down for too long. ° HotShot™ Boost mode allows you to get more flavor and vapor with a short power boost with each puff. This setting is adjustable allowing you to dial-in your favorite boost time setting. ° Scrolling OTS (Onboard Troubleshooting System) keeps the user informed of any problems and how to resolve them with clear instructions. ° Amperage limit of up to 5.5 amps will protect against over-current situations. ° Battery “mileage gauge” tells you how much energy is available to the atomizer. ° Smart safety features provide the highest levels of safety available on any device in the world. If you press the button and can vape, it’s safe! ° Thermal monitoring shuts the device off if it detects a high temperature condition. ° IQ™ (Input Quality) monitor provides feedback on the condition of your battery and connections. This never before seen feature not only can test your batteries, but also alert you if there is a problem with one of your cells. Battery safety is very important to us! ° Left & Right handed mode allows the user to select which way the display reads. ° Check All mode allows the user to see all their critical settings at a quick glance with one button press (adjustable settings). ° Save profile – Save all of your favorite settings into 5 available memory slots for quick recall. ° Scroll speed adjust allows the user to select the speed of the scrolling menu. ° OLED brightness adjustment lets you vary the display intensity. ° Exclusive reliable and safe electronic switch is designed for long life. ° Battery Monitoring shuts the unit off once a battery has reached end-of-charge. ° Reverse battery protection keeps the circuit safe if the battery is accidentally installed backwards. ° The P3 is compatible with flat top batteries. ° No compromise components ensures a high quality and reliable device. ° Proudly made in the USA. ° 1 Year Warranty: Excludes accessories like batteries and atomizers.